This year marks the fifth dance recital for the big sister and the third for the little one. I was admittedly nervous about the first dance recital and I was too busy riding a high horse about femininity, the patriarchy and sexualized bodies to see that my own daughters were having the time of their lives. After that, I made no apologies for how hard I fell in love with a tutus, sequins and stage makeup for my own tiny dancers. It was not as bad as I thought it would be. That was five years ago. Those two little women are taller and bolder. They love to dance, and they loved their moment in the spotlight. Watching them do something they love is a supreme honor. I can see their earnest faces trying hard not to count out loud, focused on getting the steps right. We have practiced endlessly in the kitchen (during and) after dinner and every time their dance recital songs cycle up on the car stereo, we all squeal and do the steps, belted into our seats. On the big night, I gaped at them, their long legs and bouncy ponytails and sparkly costumes. How could they be mine? How did they get to be so tall and proud and full of sunshine? For most of the recital, I was breathless because watching them this year, I felt like I was stuck in place while the world pulsed around me. Were my little people ever as small as the peanuts who took the stage before them? Were they ever so wild or timid? The range of emotions on stage from sheer terror to total joy further disoriented me. Sitting in that dark auditorium, I felt small, walled off from the chaos of the world. And in that cozy space, I could fully focus. Nothing in the world matters when you’re watching 20 four-year-olds live out their dream of performing on stage, clad in sequins while their favorite music blasts in the background. There is an incredible sense of reassurance that if the world ended tomorrow, we did something right raising these little bouncing people. The best part of the recital, though, was when a friend pulled me aside to tell me that she snapped a photo she had to share. And later via text, I saw it. It’s gray and fuzzy and you can hardly make out the shape of my husband and me while we wear the widest smiles. My hands are clasped in total delight as I watch them. Our friend caught us fully present in this moment, adoring our children and radiating love. I remember the moment she snapped the picture–though it wasn’t a singular moment. It was a series of moments strung together watching my girls. I got lost in watching my children mixed in with everyone else’s children because I love and adore those children, too. 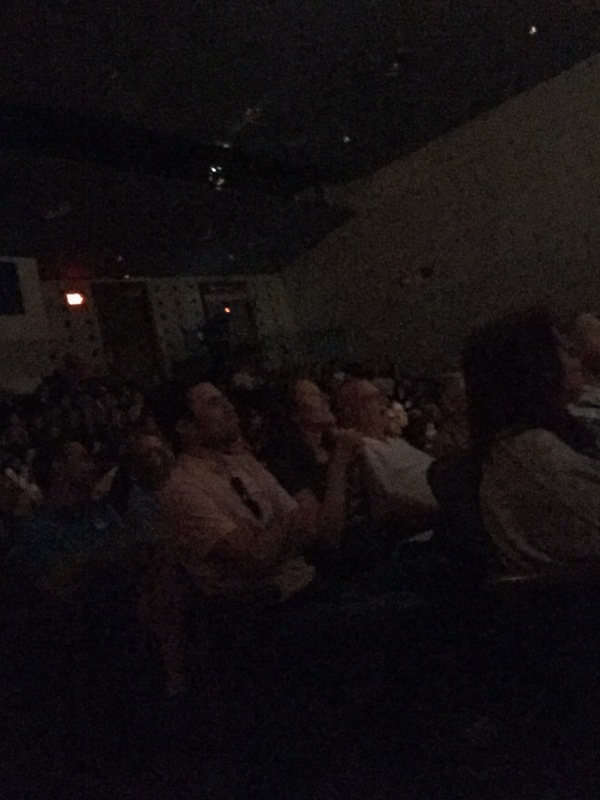 It is my favorite part of the dance recital–feeling like I am a part of some bigger community of people, seated in the dark, cheering for the future. I feel your pride, your worries, your anxieties. And I share in them. And in the middle of every song, I remember feeling fully present and happy and if I could bottle that feeling, I’d take it like medicine every day. We lose focus. We get lost. But these little slivers of life should center us, bring us back, and remind us what’s important. And dancing like no one is watching (except we’re all watching, and we love every minute of it). This entry was posted in everyday life, family, kids, lessons learned, motherhood, parenthood, personal, Uncategorized and tagged dance recital, feminism, kids. Bookmark the permalink.